Our upcoming Good Lawyer Book! Rose Heart Publishing™ in collaboration with Prihartono & Partners – Law Offices will proudly launch a Collection of Legal Stories written by Indonesian Bloggers. 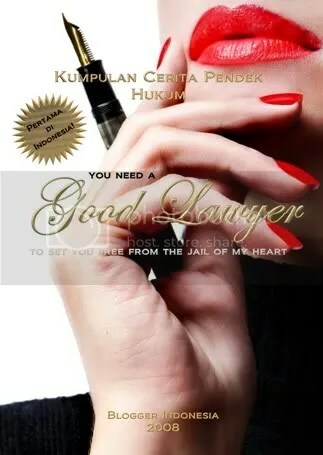 The Collection titled “GOOD LAWYER” will become the first and only book to blend literature with Indonesian legal norms, springing from the ideas and creativeness of the young bloggers of Indonesia associated under the banner of Roseheart Writers, including authors such as: Mhimi, Deesan, Ferror, Nina, Jini, Riu, Haerul, Nia, Rinnie, Ebramn, Eny, Henny and many more! Check out these interesting dialogues for starters! “Daeng, not even your hut and my rickshaw together will be enough to pay Rose, and Rose will only accept Dollars…!! Read that newspaper well…!! She is Miss Dollar Lawyer, a lawyer who is paid in dollars…! !” cried Jamal to Daeng Lira with some frustration. Anyone who lives in this town would be well familiar with this lawyer. “Pak Yosef … Pak Yosef has just been murdered!! !” cried Candice sobbing. “What? ?” Mandy was startled beyond her wits. “Pak Yosef was just murdered!! !” Candice’s cries become louder. “Calm yourself Candice … please, calm down, “ said Mandy, trying to get Candice to stop crying. “Pak Yosef was just murdered!!! Murdered! !,” said Candice nearing hysterics, as if she didn’t hear Mandy’s words. Aida did not show any fear. “Alright, we will meet at the pre-hearing. I will also tell the court about the Garda incident, where the police slipped and deliberately showed the evidence to the suspect, allowing the accused to panic and end up losing his life. This all lies on your shoulders as the head of unit, as it was your men who conducted the investigations!” exclaimed Aida while getting up from her chair and walking towards the door. “Noooo……. !!! !” Shofie cried hysterically upon hearing the court ruling, unbelieving of what she had just heard. How can a lawyer as capable of herself lose to some amateur from the small Ngajuk town. “Nooooooooooooooo… ! !” she kept on shouting. And many more suspenseful legal stories! Expect it to hit the shelves of your nearest bookstores soon!